I've had an idea for Game Chef...lets see if the ingredients allow me to run with it. I honestly hope they do, because this is one of the best titles I have ever heard :) fingers crossed the ingredients play out. OK, instead of "Rosencrantz and Guildenstern are Dwarves", my mental patterns in waiting for the ingredients have altered. I'm now thinking of all the characters who die in Shakespeare, then running a series of modules based on the Verona Police Department tracking down and putting their own interpretation on events to discover what really happened (the play we al know is just the public spin on events, investigation may lead to someone else being the culprit). Does that mean we get to play Dogberry? One of the other game design threads mentions the idea of using the four humours, as found in medical and scientific belief of the Shakespearean era. (I've had a quick look through the other threads, but can't find it...otherwise I would have provided a link). With this in mind, I've been looking at a few concepts for getting a game mechanisms with an Elizabethan/Jacobean vibe. Apparently a game of the era was one-and-thirty, a precursor to our modern game of 21. In this game you add up cards in your hand from a single suit and aim to get as close to 31 as possible (but not over), you could have cards from multiple suits in your hand but only one suit counts. If I combine the ideas of the four humours with the four suits of cards, these become the archetypal actions of the game. The degree of success of failure with these actions could be determined through a played out hand of one-and-thirty (with the closest to 31 proving successful in the round). If you lose a hand of one-and-thirty, you lose a coin (from a starting pool of 4) or fold over the corner of a note (I'm tending toward this second option)...each of these could be used as a way of losing a hit point or character trait. I'm thinking that this game will not be very combat oriented, and will be more about relationships...friendships, enmities, betrayal, shifting loyalties, unexpected twists. Thought: Maybe when you choose to harm someone, the damage you do to them is based on the strength of your relationship to them. If there is conflict with someone you don't care about, you can only damage their traits or cause them an inconvenience. If you know the person and they mean something to you (either as a friend or enemy), then you can seriously harm them or cause lasting trait damage. If it is a personal nemesis or a true love, your actions can be lethal. But now I'm looking for ways to pull these Elizabethan/Jacobean mechanisms back into the storytelling techniques. The general structure of the game will follow the structural form of "Rosencrantz and Guildenstern are Dead", where the narrative exists parallel to an existing play, involving the lesser characters and their exploits when they are "offscreen" with respect to the established play. The players will know the events that occur when their characters appear in the established scenes of the story, but they are free to meander and change the context of the known scenes, in fact they are expected to do so to gain the highest possible advantage from the set piece. 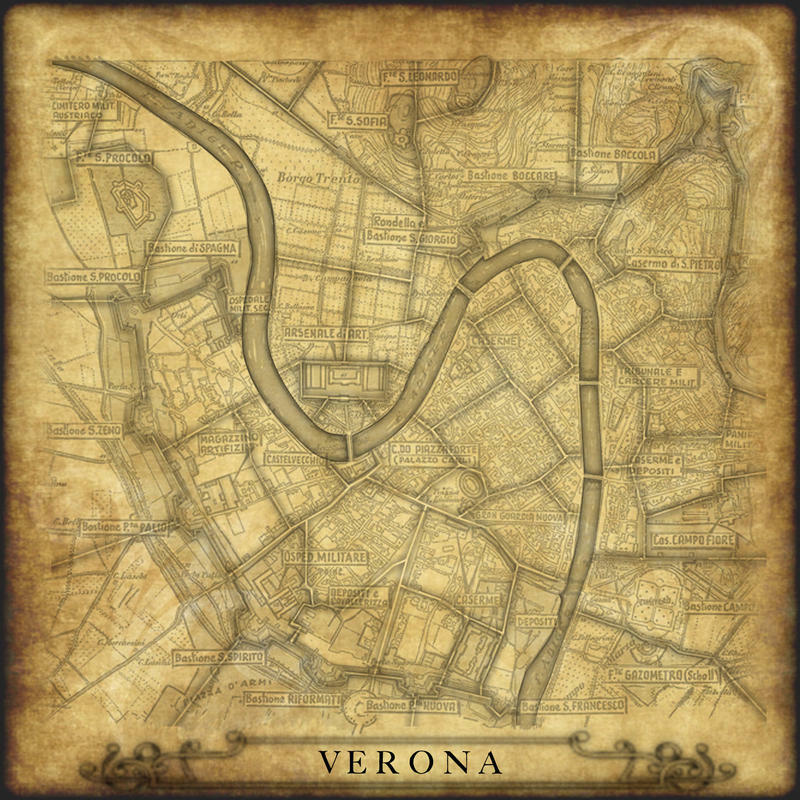 I'm thinking of using maps of Verona and other cities relevant to each play as play aids for a session...linking characters to specific locations and applying automatic relationship connections between certain characters as defined by the plays in which they are found. Forsworn: It seems that all characters in drama change in at east one aspect of their lives, forswearing something important to their former lives before they are able to move onward...(and often it is the inability to forswear a certain aspect of their life that leads to a dramatic death). Nature: A character will be defined by the natures of their sanguine humours. These will be the core attributes and traits of their persona. Exile: Do I limit the characters to those who are far from home and caught up in the events of the play? Daughter: Do I limit the characters to the female roles? Unsure on that last one. Since I'm a very visual designer, here's a link to the game board I'm working on for this project. It's a work in progress, and the character sheet will have a similar look. I've been playing through the logistics of my game design and there are a few things I'm having trouble reconciling. I don't think I'll have the time to thoroughly research a Shakespearean play to the degree, so I'm shifting more toward something that aims to capture the essence of a play from this era. Revenge, Betrayal, Love, Comedy, Tragedy. Set in a semi-mythical and exotic Verona (which may or may not bear a close resemblance to the "real" Verona of the time). Characters with shifting alliances and values that change between the beginning and end of the drama. I'm shifting toward the characters being the manipulators of events. There is a central character whose story is being told. One player could portray his/her mentor, another takes on the role of his/her childhood friend, another player takes on the role of his/her nemesis, another could be a lover...the important thing is that each of the player characters is a secondary role in the story. They are specifically exiled from the core events in some way...they cannot be the main protagonist. But they can manipulate the protagonist (and one another) to their heart's content). All characters would have a starting archetypal nature (which is open for all to see), and an ending archetypal nature (which is secret). The nemesis who becomes a lover, the mentor who ends up betraying the protagonist, the friend who is revealed as a woman even though the protagonist thought him a man for many a year. Archetypal natures have ends and means; the ends are goals pursued by this character within the narrative, the means are the tools by which they can manipulate the story and world around them. A player character gains quite a bonus when their end archetypal nature is revealed, but also suffers penalties when their true agenda is revealed. One-and-Thirty still applies as the core game mechanism, but now players describe an off-stage scene when their hands are drawn, while the on-stage scene is played out when the hands are compared. The manipulation of the protagonist works with the game board I have already designed. If you win the scene with a hand of hearts, the protagonist moves toward the "hearts" side of the board. The manipulations of the players affect the outlook of the protagonist and thus change the way the story progresses. If you fail an action against the protagonist, you suffer some kind of penalty based on where the protagonist currently sits on the board. I'm still nutting out a few of the finer details, but I think I might be onto something here...(and if not, this will probably form the basis of another FUBAR supplement). Nice work. They look good. Characters are defined by 4 descriptors and two archetypes. Distinction: Allows a character to change the suit of a card, if it can be incorporated into the scene. All distinctions have a specific suit that they change cards into (indicated by circling the suit), and a specific suits that they may not change (indicated by crossing out the suit). Each distinction also has a linked reputation; this is a short single sentence describing how the character has used this distinction, or what other people think of the character�s distinction. Archetype: A characters have a pair of archetypes; one is a starting archetype (publically known to all other characters at the start of the play), the other is an ending archetype (hidden from the other characters and players until a strategic moment to reveal the truth arises). Each starting archetype has two methods for gaining influence within the story, and one method for losing it. Each ending archetype has a single method for gaining influence in the story, and a method for losing it). Game play is divided into two alternating sequences. A session plays out over the course of three to five acts (typically an hour per act), each act may have 3 or more scenes (about 10-20 minutes per scene). Players start with four aspects defining their key character traits, they also start with two archetypes....the first describes they role at the start of the story, the second describes their true role in the story (something that will be revealed through the course of play). [This has basically been described earlier]. Working off a GM-less assumption, each player would be given a number of tokens to set scenes and a number of tokens to twist scenes. During the backstage phase, each player is dealt a hand of cards. Cards are dealt face-down, a player may choose to reveal a card to determine something about the onstage scene about to be played (Players may also determine something about the scene by spending tokens from a starting pool...different archetypes will have a different starting pool). The different revelations about the impending scene will make certain character aspects useful or not. 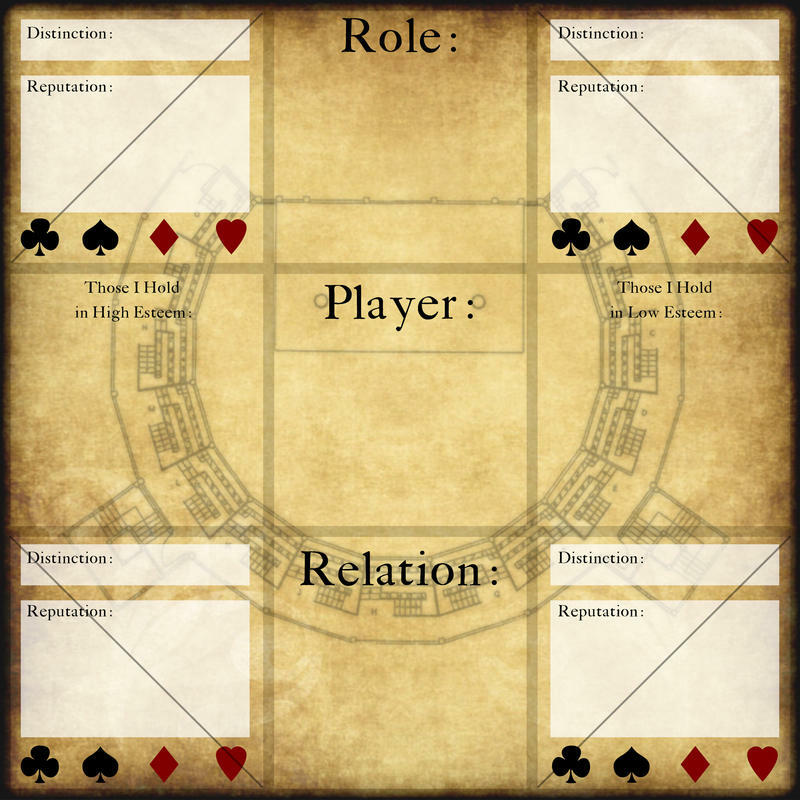 A player may choose whether to engage their character in the scene or not (doing so costs a variable number of tokens...also determined by the starting archetype). If a player chooses not to engage in a scene with a character, they become the peanut gallery. The peanut gallery determines the success or failure of actions undertaken by characters onstage. All players start with a number of scene manipulation tokens, their archetypes may provide effects which manipulate the regular scene development cycle. Players agree to a duration and a number of acts for their game (divide the duration by the number of acts to see how long each act should last). 1. Starting with the player possessing the lowest number of tokens, each player is dealt a card in turn. This card may be kept concealed, or it may be revealed. If revealed, the player may earn a token, or they may spend a token to describe something about the impending scene. The first thing described shall be the location, the second thing shall be whether the protagonist is present, additional descriptions shall be the presence of lesser characters. 2. Once a player believes that they have a hand that will beat the other players, they knock on the table. Each other player in turn may draw a single additional card if they choose. If the location and presence of the protagonist have not been established by the time someone knocks, the players immediately following the knocking player determine these aspects of the scene. 3. When all players have taken the chance to engage in the scene, they may then spend any tokens to engage their character in the scene. If a player chooses not to engage in the scene they become a part of the peanut gallery. 4. The scene begins with the character bearing the highest ranked archetype, the player of this character describes what they are doing with the protagonist (if the protagonist is present in this scene), otherwise they just explain what they are doing. 5. If the character hopes to manipulate the protagonist (or another character) in some way, the player plays a card from their hand (this may be a card that was previously revealed during the offscreen phase, or it may be a card still concealed in their hand). The suit of this card must reflect the action performed, or a character distinction must be used to change the suit (each distinction may be used this way only once per scene). 6. If manipulating another player, the target may either simply allow it, or describe a defensive action and reveal a card from their hand (this card must have a suit matching the action described). Any member of the peanut gallery may choose to add a card from their hand to the active player or the reactive player. If the reactive card is higher, the action is blocked; if it is equal or lower, the action passes through. 7. If manipulating the protagonist, the member of the peanut gallery with the lowest ranked archetype describes how the protagonist reacts (a card is always drawn by the protagonist when someone is manipulating them). 8. When an action is successful, something about the scene may be altered or a relationship may be changed (depending on the type of action performed). Unsuccessful action draws a penalty based on the protagonist�s current balance of humours. If the protagonist isn�t present, an unsuccessful action has no effect. 9. Any other player may initiate an action (if two players want their characters to initiate actions, the character with the highest ranked archetype takes precedence), all players must have the opportunity to act before a player may take a subsequent action. 10. Once a player has revealed all of the cards they wish to, their revealed hand is considered locked. Once all players with characters onstage have locked their hands, the total is revealed. A single card suit is used to determine this total. 11. The highest scoring player whose hand does not exceed 31 gains the opportunity to explain how the scene resolves. 12. The suit of the winning hand determines changes in the outlook of the protagonist (using actions of a sanguine nature will cause the protagonist's manner to become more sanguine). The lowest scoring player with a character in the scene loses one of the distinctions they used in the scene (if no distinction was used, the player loses half of their tokens). The highest scoring player may choose another character present in the scene, forcing them to either gain or lose a distinction. Once scene is resolved, a new offstage phase begins. When the act's duration has expired, the current scene will be the last scene in the act. When the act expires, all characters may unfold a single corner of their character sheet to re-expose one of their distinctions for use in the game. I'm getting so caught up in certain aspects of this that I'm not sure it's still coherent for an outsider. New Tentative Title: "The 38th Manuscript". Well, the nitpicker in me wants to point out that "peanut gallery" is vaudville, and thus anachronistic as well as from the wrong continent. The UK equivalent is 'the gods', which may be more evocative, but the temporally correct one would be "the Pit" or "the Yard": the groundlings, of course, were the audience nearest to the ground. The mechanics seem to make sense, although I might worry about death-spirals if there's nothing to balance out the penalty for losing in scenes. The "Peanut Gallery" was just a working title for the concept. �The Great Bard�, that�s what they call him. Playwright, poet, balladeer, wordsmith, actor, drunkard. The King�s Men know that he is a genius, but he often needs a bit of motivation to restore the balance of his creative humours. He sleeps away the hours in a stupor, hunched over wine or gin, whatever may have drawn his fancy or whim. Sitting around him, the King�s Men have taken to a game of storytelling and impromptu playwrighting. None know how the game began. Perhaps as a simple wager of a new play�s name, but with each passing night, the diversion gradually became refined into a method of writing complete compositions (comedic, dramatic and tragic). Many has been the night when the kings men would have played their game over a semi-conscious �Great Bard�; only to find him finishing a masterpiece based on his �fever dreams� of the night before. In the taverns around the theatre, there is a common form of gambling referred to as �One-and-Thirty�, this is a game played using cards of the common French variety. There are a few varieties of this game, but that which is used by the King�s Men aims to draw a hand with a single suit�s total value nearing as close to 31 without exceeding this amount. At the start of a round, each player is dealt three cards; the last of which is dealt face up. Starting with the player to the left of the dealer, each player has the opportunity to draw an additional card (�have it�) or pass (�stick�). After all players have been presented with the opportunity to draw an additional card, the cycle begins anew. At any stage, a player may knock the table to indicate that they believe their hand superior to all other players. Once a payer has knocked, all hands are revealed. The player with the highest scoring single suit (not exceeding 31) proves victorious. Wagers are often a part of this game, with each player holding a note indicating their wager value. A player failing to win a round must fold over a corner of their note; while a victorious player unfolds a corner of their note. A player with all four of their note corners folded is eliminated from the game (though they may re-enter the game by purchasing a new wager note). The King�s Men have twisted the rules of �One-and-Thirty� to create plays while the great bard slumbers in a drunken stupor after one of his legendary �all-night tempests�. I've just finished my Game Chef Entry. I've uploaded it on the Vulpinoid Studios site.